NOTE: This is my front page article in this week’s Catholic Free Press (November 11, 2016). St. Ann Melkite Church, Waterford, CT.
Dennis McCarthy drove by the same church each day on the way to work in Hartford, CT. The sign read “St. Ann’s Melkite Catholic Church” and it looked like no Catholic Church Mr. McCarthy had seen before. The priest gave a generous gift of his time; the fruit of that gift was a reawakening of a vocation in Mr. McCarthy. He began attending St. Ann’s in 1995 and was ordained a deacon in 2003. His wife Lisa, also Catholic, was taken aback at first as the Eastern Catholic Church is not well known to Roman Catholics. Mr. McCarthy invited her to come to Divine Liturgy with him as she was curious about it, and she came to understand better her husband’s attraction. “It was an education process,” he said. They maintain an ‘East-West’ home as Lisa has remained Roman Catholic. “A priest told me, ‘People pray in different ways, they are comfortable in different rites; there’s nothing wrong with that,’” he said. Mr. McCarthy served for several years in the military before settling in CT. A change of jobs brought him to the Worcester area where he now serves as deacon at Our Lady of Perpetual Help on Hamilton Street in Worcester, MA with the Rev. Paul Frechette. Deacon Dennis has a BA from the University of Connecticut in Economics, an MA in Human Resources Management from Pepperdine University, a Juris Doctor from the University of Connecticut School of Law, and an MA in Theology from Providence College. He is currently enrolled in an advanced Theology Certificate program at Boston College School of Theology and Ministry. The Eastern Catholic Church contains twenty-three different branches including the Maronite and Melkite communities. The Eparchy of Newton, led for the last five years by Bishop Nicholas Samra, oversees the Melkite Church. The Eastern Church celebrates the liturgy using the Byzantine rite. In 2014 Pope Francis lifted the restriction on Eastern Churches ordaining married men into the priesthood as had always been their tradition. Through aggressive and effective outreach to men, Bishop Nicholas has ordained several priests and deacons: “Eleven priests and eight deacons. Two [are] celibate eparchial priests and one religious. The other eight are married priests,” he said. Bishop Nicholas, aided by Deacon Dennis, ordains Rich Bailey as subdeacon at Our Lady of Perpetual Help in Worcester, MA. Many non-Melkites are choosing to join the church because of their attachment to eastern spirituality and liturgy. As a result of this growth, Bishop Nicholas made an extraordinary appeal to the Pope. “I requested from Pope Francis to name a second cathedral in the USA – the parish church of St. Anne in Los Angeles. He consented graciously and we celebrated this naming with the presence of Cardinal Leonardo Sandri, prefect of the Congregation for the Eastern Churches and delegate of the Pope to proclaim the cathedral.” It is hoped that a second eparchy can be created in California. Bishop Nicholas Samra delivers his homily during the Divine Liturgy at Our Lady of Perpetual Help Church in Worcester, MA. Deacon Dennis McCarthy is part of this growth by making the decision to explore his vocation more deeply. “I always felt a desire to perhaps be a priest growing up, but focused on other things. The interest was awakened after I had been a part of the St Ann community in Waterford for a few years,” he said. When the path was opened regarding married priests, Deacon Dennis knew it was time to pursue his vocation as a priest. Bishop Nicholas’ support and encouragement has been a key factor in Deacon Dennis’ spiritual development. “Bishop Nicholas has been a really good leader. Having been born in the United States and growing up [here] while having the Middle Eastern background, he is the perfect bridge between the United States and the Patriarch. He’s really got a plan for the church; he’s got a very practical approach to the practical, everyday necessities of the church to have it survive. He’s done all the right things. He’s got a mission and a vision and he doesn’t veer from that. That’s comforting to know to have someone like that at the helm of the church. He’s been very supportive of me since I became a deacon,” said Mr. McCarthy. Despite logistical hurdles, Bishop Nicholas is committed to ordaining married men to the priesthood. “The church is still struggling with it because you have the issue of health insurance for the spouse — if the spouse doesn’t have health insurance and you have to cover the spouse now along with the priest. And what about the kids? There are financial concerns that the eparchy is still struggling with. It’s been a bold move on his [the bishop’s] part,” said Mr. McCarthy. Deacon Dennis is both excited and at peace about his future. “It is very humbling to think about the possibility of celebrating the Liturgy as a priest,” he said. Note: Susan Bailey’s husband, Deacon Elias (Richard Bailey) served with and was mentored by Deacon Dennis while serving at Our Lady of Perpetual Help Church on Hamilton Street in Worcester. He aided in the writing of this piece. Join my Email List to subscribe to this blog andreceive your free coloring book (and more). I live in an East-West household. My husband represents the East as a deacon in the Eastern Catholic Melkite Church. The Eastern Catholic Churches celebrate the Byzantine liturgy with its many beautiful and meaningful rituals. Their sanctuaries are full of beautiful icons with gold backgrounds; they appear at times translucent, permitting the eye and the imagination to travel beyond this world to heavenly heights. 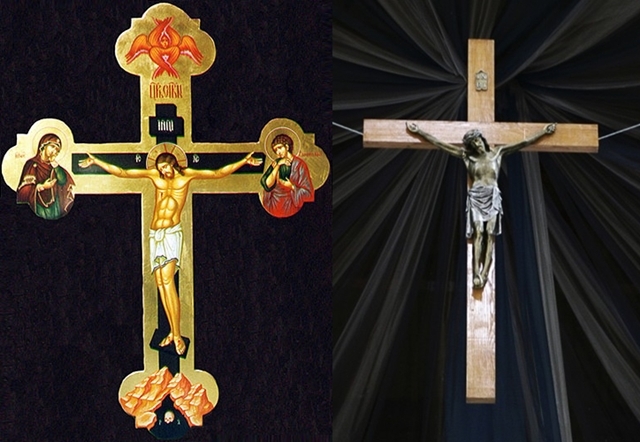 It’s the Orthodox tradition: experiential, sacramental, mystical, rich and deep. 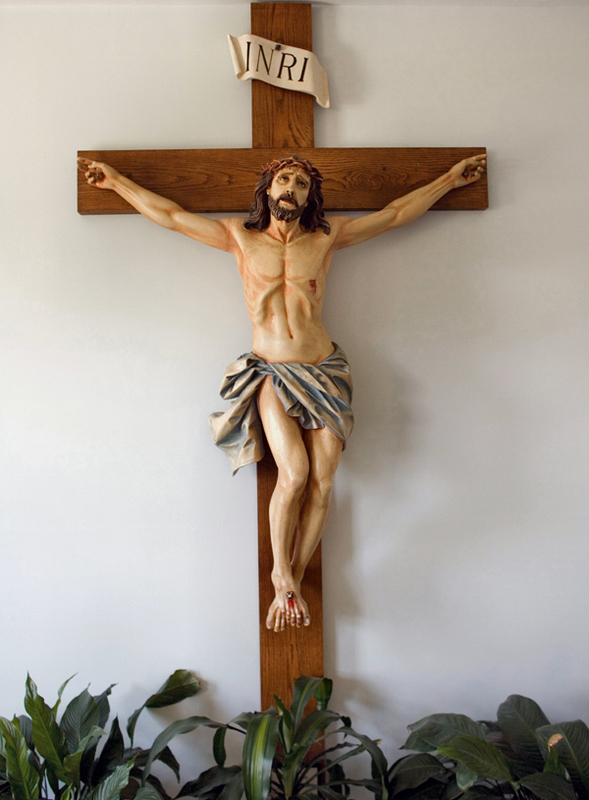 I represent the West as a Roman Catholic. My home parish is a mini cathedral with carved pillars supporting graceful Corinthian arches. Light-filled and colorful, the stained glass windows tell stories of the Gospels through the rosary mysteries. Paintings of the stations of the cross line the walls, inviting one to prayer. And the golden tabernacle, holding the true presence of Christ in the host, is positioned in the place of honor at the front of the church, behind the altar. I come from the Roman tradition, also sacramental, rich and deep, but based more on reason perhaps than experience. I love living in an East-West household, receiving the benefits of Eastern thinking, augmenting, and softening perhaps my Western way of thought. My husband and I share many lively discussions about our faith. His conversion to the Eastern Catholic Church was one of the greatest gifts to our marriage. I enjoy learning about his approach to faith and can do so readily through a website known as Ancient Faith Radio. One can listen 24/7 to beautiful Byzantine chant and learn from the many podcasts espousing Orthodox teaching. 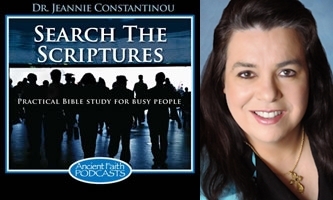 My favorite is “Search the Scriptures,” hosted by Dr. Jeannie Constantinou, presenting “interesting and accessible bible study for busy people.” Dr. Jeannie, thanks to her vast education in a variety of settings, combines a passionate love for the Bible and Orthodox spirituality with her love of ancient history. She makes the pages and people of the Bible truly come alive. It reminded me of why mystery is such a wonderful and freeing concept. 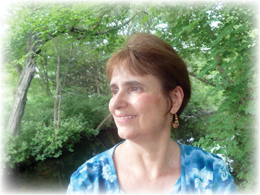 Dr. Jeannie went on to explain, citing her favorite Church Father St. John Chrysostom (aka, “The Golden Mouth), the impossibility of describing the nature and essence of God. As God is formless, there is no way to physically describe Him. Why even the seraphim are formless! So how can Isaiah write this description of heaven? Isaiah needed a way to convey the truth of what he saw in his vision: the utter majesty and glory of God. Even though seraphim are not known to have form, the traditional image is of an angel with wings (and in this case, six). By having the seraphim covering his face and feet with his wings, Isaiah is demonstrating how the being could not look upon the countenance of God, for His glory was too much for him. St. John Chrysostom goes on to explain the meaning of the feet being covered as well as the face, as a means of demonstrating the seraphim’s knowledge that he was a lowly creature in the sight of such magnificence. Dr. Jeannie cited other parts of the Bible, including the Genesis creation story as similar examples of writers using human examples to describe the indescribable so as to convey important theological and spiritual truths. Looking at the Bible that way, backed up by rich ancient history she provides, surely does make the pages and people come alive. But the reason why I so enjoy hearing the Bible taught in this way, through the lens of Orthodoxy, is that it reminds me of the utter mystery of God. Rather than trying to explain difficult concepts such as the Holy Trinity or the essence of God, how much more enjoyable, fruitful and freeing it is to just release the need to understand and go with the flow of the mystery, allowing it to sweep me along. This, of course, requires a Guide (the Holy Spirit), thus I need to remain in prayer to continue the journey safely. The book I cited in my last post, The Naked Now, presents a simple and profound way to remain in prayer at all times and it fits in perfectly with the indescribable magnificence of God. 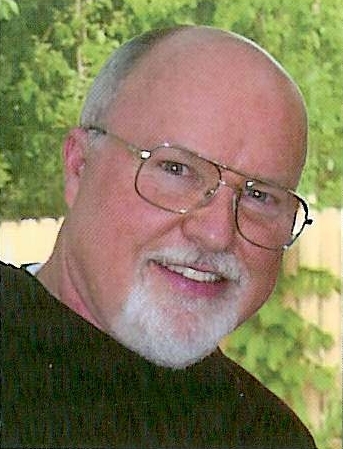 Richard Rohr, in talking about the name of God, said that word Yahweh (in Hebrew, YHVH) “was considered a literally unspeakable word … From God’s side the divine identity was kept mysterious and unavailable to the mind; when Moses asked for the divinity’s name, he got only the phrase that translates something to this effect: “I AM WHO AM … This is my name forever, this is my title for all generations.” (Exodus 3:14-15) (page 25, The Naked Now by Richard Rohr). Rohr says the word was not spoken; no, it was breathed. The first and last thing we do each day, and at the beginning and end of life. The thing that we must do to live. We breathe, thus speaking the unspeakable, over and over again. What is mysterious to you?